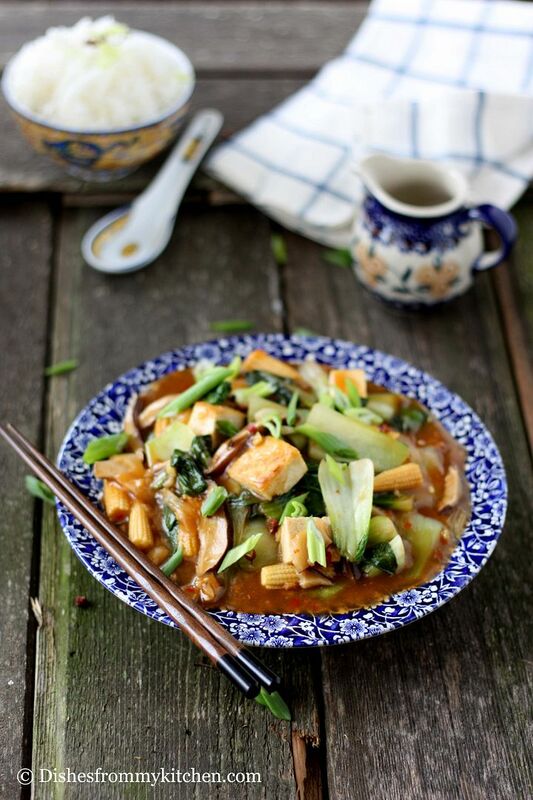 This Szechuan spiced dish is a wonderful combination of vegetables and Tofu. 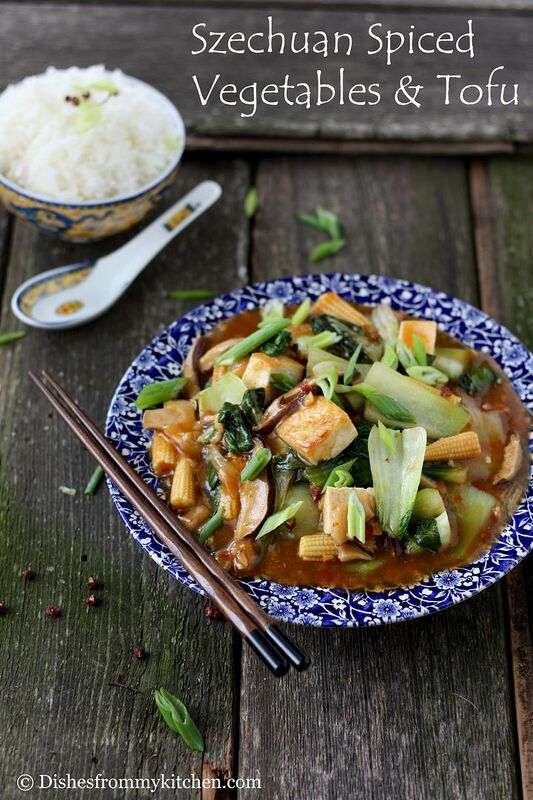 The dried reddish- brown berries which I have used in this dish are known as Szechuan peppercorns. They are not related to black pepper or chilli peppers. This peppers has a spicy-woodsy fragrance that has made it popular in all regions of china for centuries. 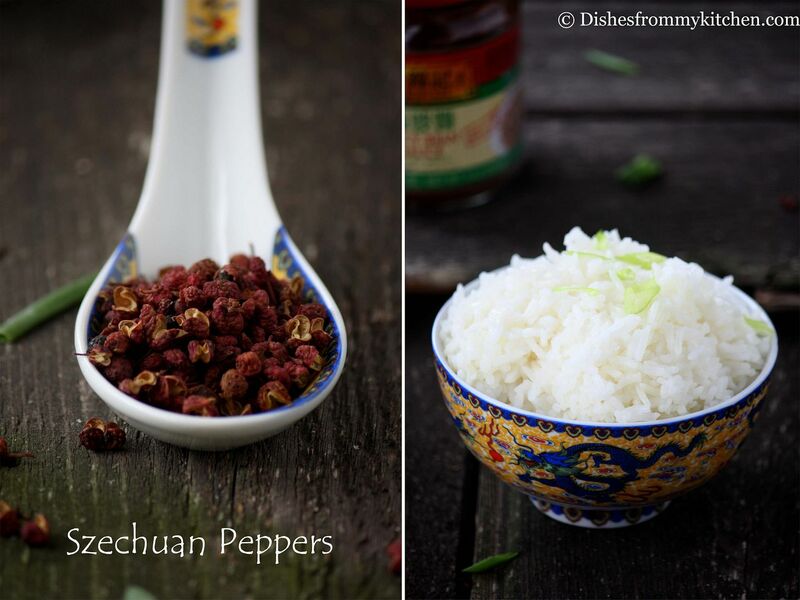 Szechuan peppercorns are one of the traditional ingredients in the chinese spice mixture five spice powder. Not only in china it is also used in Nepali, tibetan and Bhutanes cookery of the Himalayas. 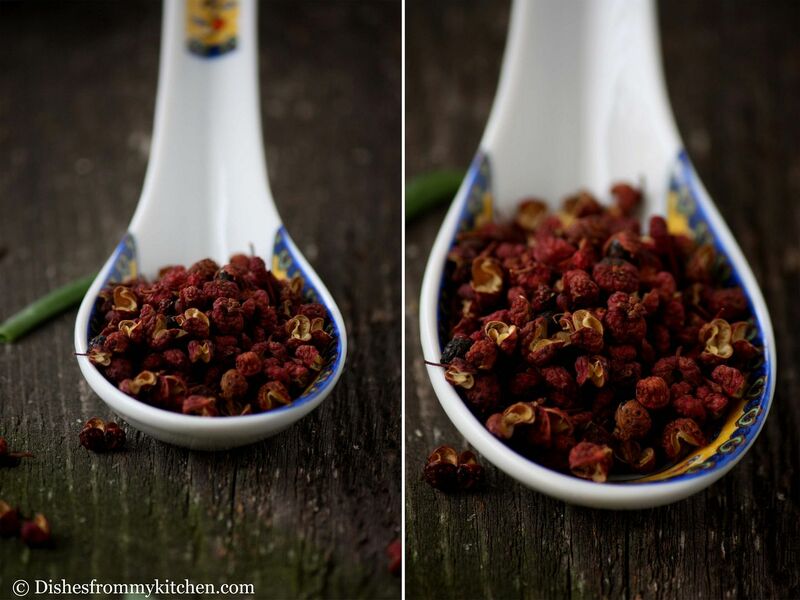 How to use Szechuan peppercorns?? Toast the Szechuan peppercorns in a dry skillet over medium heat until they begin to smoke. Do not worry even if few blacken slightly. Then grind them in a spice grinder. Store the excess powder in the jar. The Szechuan (seasoned oil) oil is used as a dressing for many Chinese salads. 1. Heat oil in the pan. Add ginger and garlic. 2. Now add baby corn, bok choy and onion. Stir fry until the bok choy is slightly wilted. 3. Now combine all the ingredients listed under the sauce. 4. Whisk and add to the pan. Boil by stirring until it is thickened. It takes just 1 minute or couple of minute. 5. Now add the cubed tofu. Heat through for 2 to 3 minutes. 6. Garnish with Scallions!!! 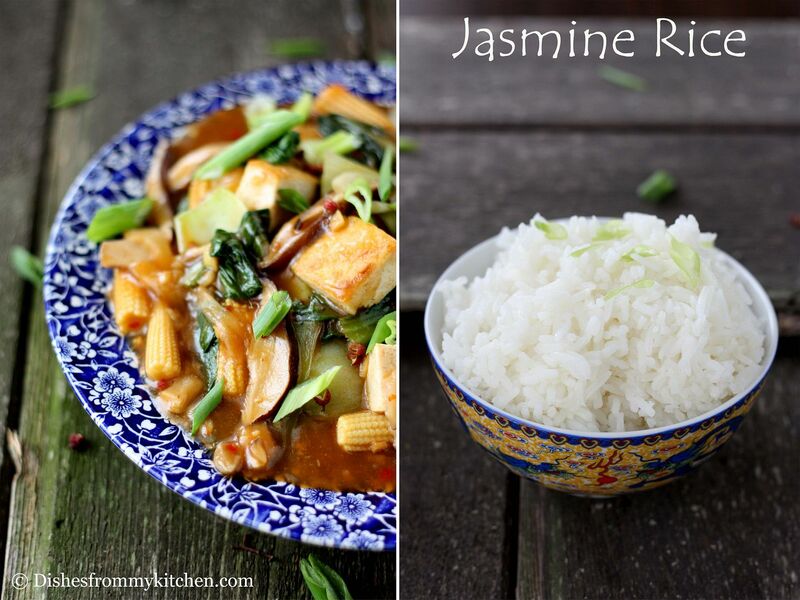 Serve hot with Jasmine rice. 1. Use Szechuan peppers as specified. Too much of pepper will be over powering. looks really yummy. From where did you buy szechuan peppers? I am looking for it for long time. 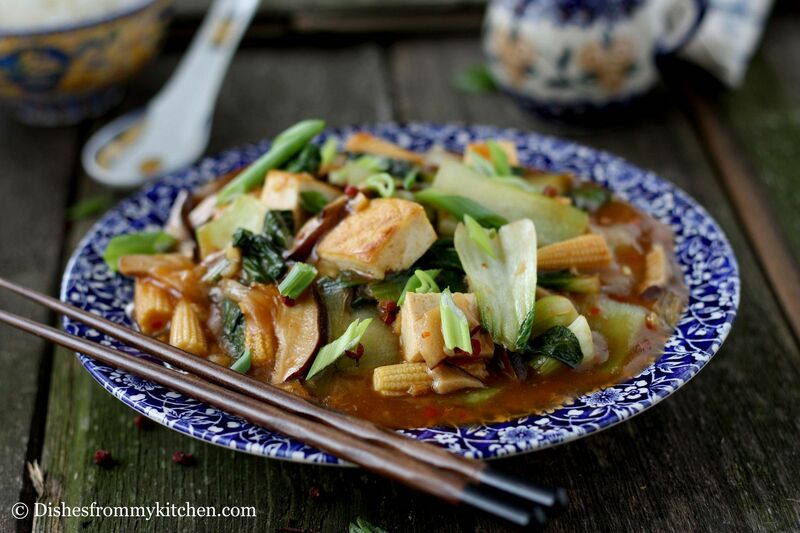 Love the flavor of szechuan peppers, this is one yummy dish! 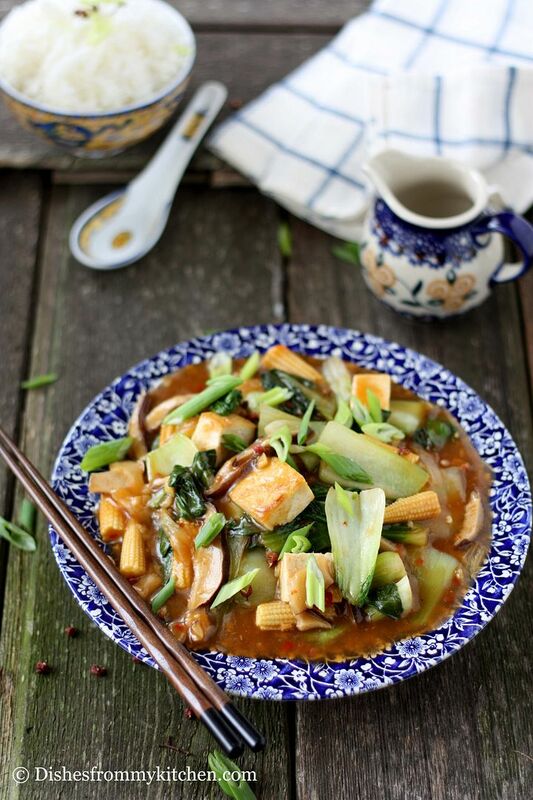 Wow,such a flavourful stir fry, wish to have with a bowl of rice. 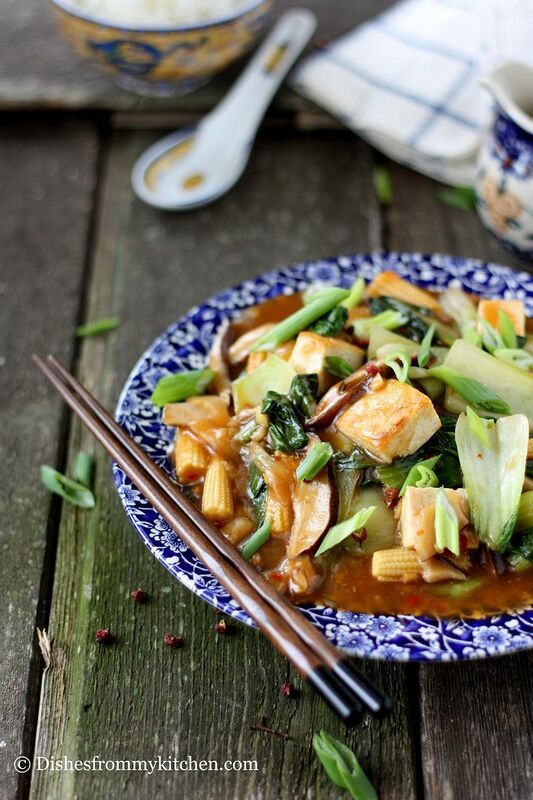 very nice and yummy stir fry.. Tried this recipe. The use of black bean paste made it overpoweringly tangy.